1. Looking back on 2014, what do you believe was the most significant development for the Workers’ Comp industry? The most significant development is the overall consolidation of larger stakeholders in workers compensation and in some cases shifting the core focus to other healthcare sectors. From bill review companies and networks to occupational medical companies, the industry’s predominant players are losing market share as smaller more nimble and tech savvy operations are filling that space. As an occupational medicine company, we see our competitors being acquired by large hospital systems or managed care insurers to make the transition to urgent and primary care due to health care reform. 2. If you could wave your magic wand, and instantly change one thing about 1) Workers’ Comp and 2) your business, what would you change? I believe there is an opportunity to improve the efficiency of cost containment and claim closure without employing per diem rate structures by specialty networks. This approach doesn’t fully account for practice management cost and we feel a change may recruit more support from the medical community. 3. What is one thing you’d like to promote? Nova Medical Centers approach to occupational medicine focuses on total care management. Treating a workers compensation claim is infinitely more complex due to the fact there are multiple stakeholders as compared to group health where urgent care and family practice is more appropriate. As an example, an employer’s sensitivities to OSHA recordability may employ a different approach to treatment and coordination with specialists while maintaining more aggressive return to work goals. This is not traditionally found in an urgent care setting due to the fact the patient is the customer not the employer or payor. 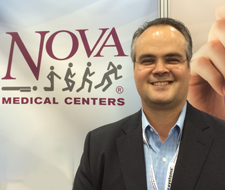 Bruce Meymand is the Chief Operating Officer for Nova Medical Centers. Mr. Meymand has more than 20 years of experience in healthcare with a record of success in strategic planning, enterprise sales, and team administration and leadership. Mr. Meymand has been a leader at Nova since 1999. His key roles also include the oversight of government and regulatory affairs, company-wide sales force, strategic network/payor contracting, software development and implementation, facility development and management and ongoing business advancement.